Spike Sings "I Love You"
It's foster Axel enjoying the weather. Age is but a number! Can you be my forever home? Contact NEBTR! We adopted Ikey from NEBTR and he is wonderful! It looks like the Easter Bunny came early for Zoey! Thank you Sharon Sweeney! Zoey couldn't even sit still for a picture she was so excited! Cappy & Boo have been with me for one month as of 3/24/16 and they have come a long way. Both have had their respective surgeries and are now recuperating very well. There is an issue with Boo’s Liver and the Vet suspects Cushing's Disease. I need to get a urine sample but that has not been easy. They will not be ready for adoption until that issue has been resolved. He goes back to the vet in 2 weeks. Both boys are a part of my pack and get along with everyone. 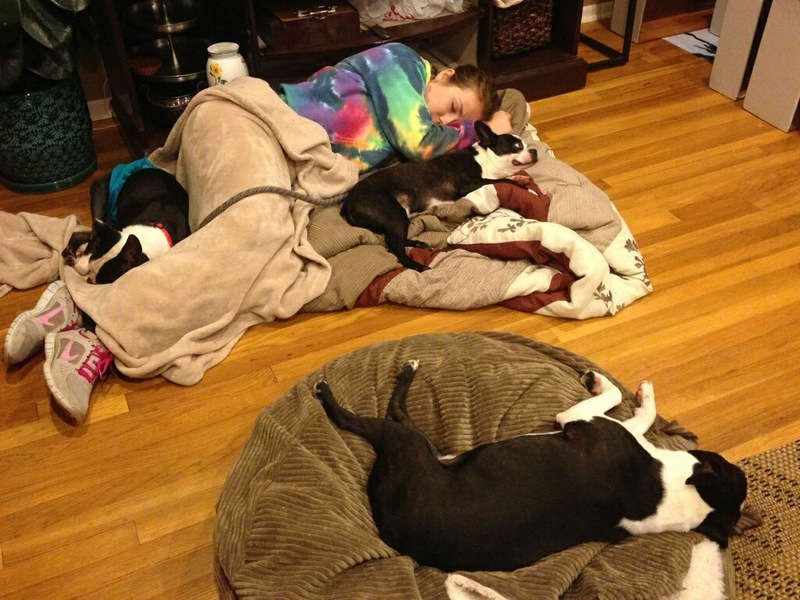 They love other dogs and people and are very loving & cuddly. They have found their space on my bed and Jaxx (GSD) has his space and no problems. I just discovered that Boo also likes to get down under the blanklets which is not a Dalmatian trait, but a BT trait. His momma was a pure bred BT. I did some investigative work to try to determine Cappy’s actual age. I called the Vet whose name was on his original Rabies tag from 2011 and he was still there. He told me the green tag from 2011 was a 1 year tag and Cappy was probably a puppy about 3-4 months old. That means he was born around Sept. or Oct. of 2010 making him 5 ½ years old. I gave him a birthday of Oct. 1st, 2010 so now we do know his age. Both boys are house broken for the most part (there have been a couple of accidents) and know where to go outside as shown in the attached pictures. My Jaxx is never very far behind them. Maggie has had this bone in her mouth for the past 10 minutes following me around the house. When I finally sat down on the couch, she laid next to me, put her paw on my arm and rolled onto her side so I could rub her belly. Maggie still kept the bone in her mouth! I just adore this girl!!! Coquito received his blanket from Courtney Kulp the day before he left me!! 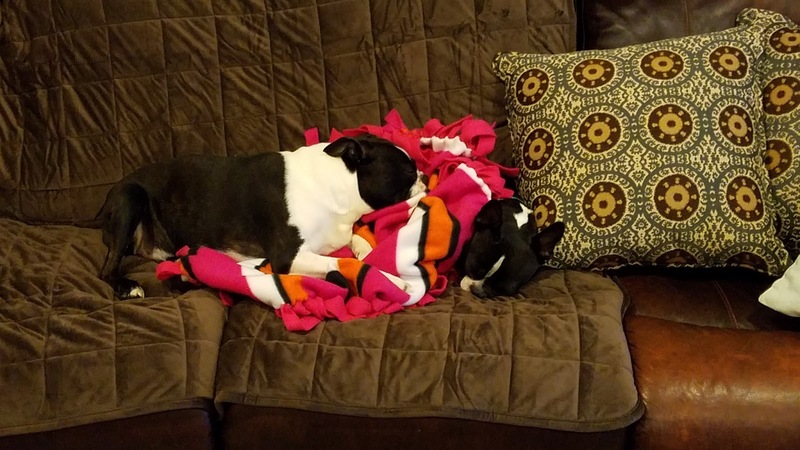 I tried to get one with him alone but my Boston Cash loved snuggling with it just as much as Coquito did (Coquito is the one under the blanket)! It went with him to his forever home 😆 thank you so much! Such a wonderful thoughtful idea. Thank you again Courtney. 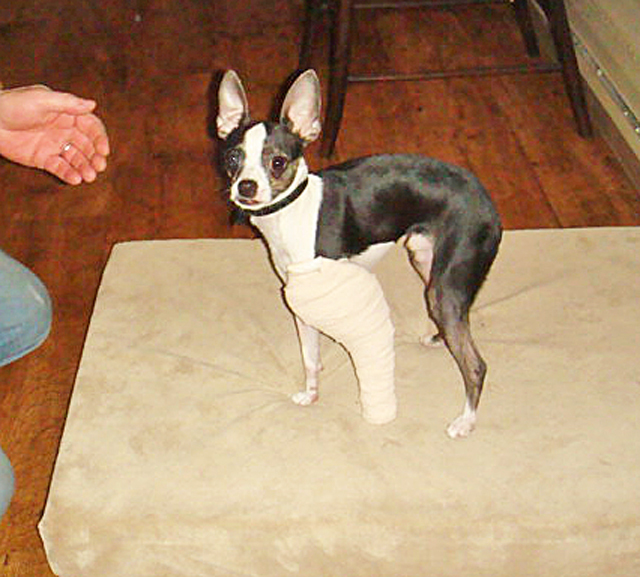 I'm sure it helped Coquito know that he was going to be loved and comforted forever more. NEBTR rescued Barca, the deaf Boston from Puerto Rico on Easter Sunday. unable to stop his barking and his neighbors were getting very upset. stressed and confused from his long travel day and new surroundings. with him all night to soothe his anxiety. Barca is the one snuggled up to Amanda's legs. Yes, Amanda stayed on the floor all night with him. who sacrifice so much to help the Bostons who need them! Amanda, you are an amazing angel! 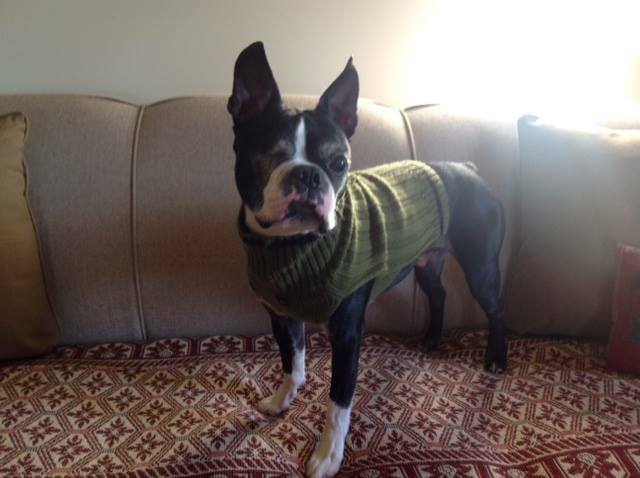 Barca is a lucky little guy to be fostered by an angel. I think Barca knows he has finally found someone who understands him.